Of all the things going on at EVE Fanfest 2014, I was most excited to get my hands on EVE Valkyrie. There are a few reasons for this: I've heard it steals the show at every event it's at. I'm excited by anything in the virtual reality scene. And, because it was just announced, I want to see what it feels like in Unreal Engine 4. 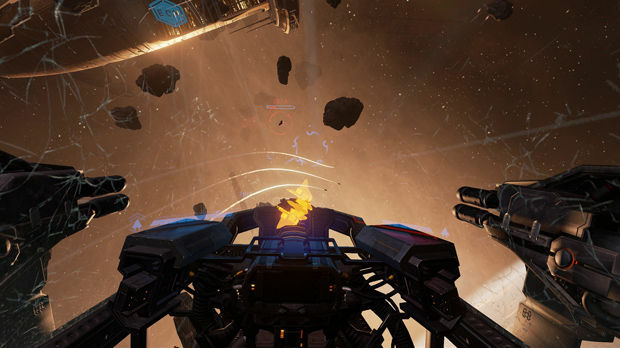 Well, I got my chance to play it, and I can see why Oculus VR is touting Valkyrie as its flagship title. It's just that good. For anyone that doesn't know what Valkyrie's all about, Dale covered that in substantial depth last year. He was impressed then. After talking to a developer about the changes that have happened since, it sounds like CCP has come a long way. The biggest move to hit Valkyrie was the switch from Unity to Unreal Engine 4. According to senior programmer Sigurdur Gunnarsson, the reason for this hinged largely upon the console scene, specifically because it's easier and a more certain prospect to publish on PlayStation 4 in Unreal right now. Apart from that, Unreal gives them the ability to add assets more quickly and generally speeds up development time. If it sounds like a lot of work to completely rebuild a game, it is. CCP Newcastle has a team of about 23 people currently assigned to Valkyrie, and it took three to four months to make the transition. But, Gunnarsson remarked that the benefits of Unreal Engine 4 at this point are too great to ignore. Besides, it's not like Valkyrie's in a finished state right now, anyway; it's still constantly being changed. While the engine change shines behind-the-scenes, it's the new hardware up front that makes the most noticeable difference. The Oculus DK2 was being used for the demo, and it made for a much more immersive experience, one that Gunnarsson was quick to talk about. He remarked that the better resolution, tracking ability, and reduction of motion blur made this build of Valkyrie better than anything that had been shown in the past. I'm inclined to believe him, because everything felt so incredibly smooth, moreso than any other Oculus title I've seen before. Although it seems to be in good shape right now, Valkyrie's far from done. There are lot of gameplay decisions that are still being made. Our demo was four versus four, but that's not what we can expect in the finished product. 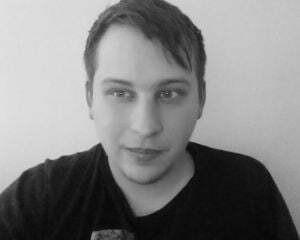 According to Gunnarsson, CCP's looking at numbers like 16 or 24 total players, but it completely depends on what makes sense from a gameplay perspective. If increased numbers make it less fun, they're not going to make that sacrifice. CCP's also adding variation in a couple of areas. Internally, the team's looking at different classes of ships such as a heavy, and a support that could provide medic or logistical assistance. The maps will also be themed, with some adding different environmental hazards. One example I was given was a map where sections are prone to electrical storms. Given that CCP has more than 500,000 subscribers that play EVE Online, it's easy to see the direction it might eventually go with Valkyrie. For now, Gunnarsson insisted that the company is treating its titles separately, and isn't concerned with melding them. However, does CCP envision a future where all of its players have a Rift unit strapped to their head as they pilot their spaceships? It's certainly an intriguing possibility, one that almost has to eventually be entertained to some extent. 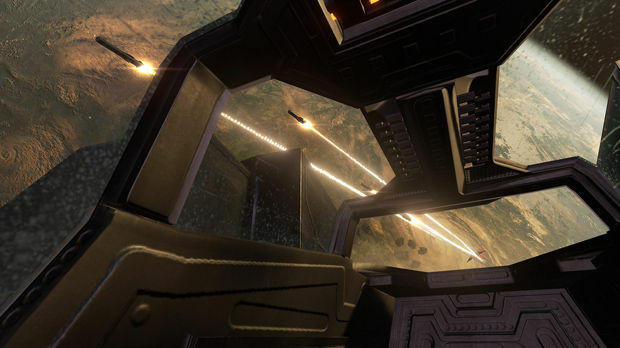 There's a lot going on with Valkyrie, and Oculus VR appears to fully understand its potential. Gunnarsson commented that CCP interacts with Oculus daily, and they're very supportive with regard to resolving any issues that CCP might have. 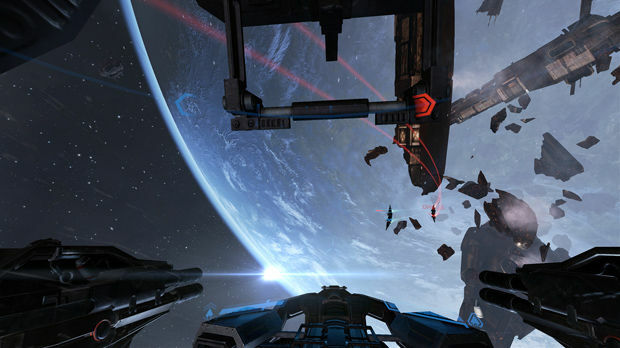 Gunnarsson also added that Oculus completely trusts CCP and hasn't ever tried to influence the direction of Valkyrie. That's impressive given how EVE Valkyrie might be the game that drives consumer adoption. We don't know when the Oculus Rift will eventually release, but I was told that Valkyrie will launch right alongside it. Judging by the demo at Fanfest, I'd be hard-pressed to think that any early adopters would be disappointed in that investment.